People, generally speaking that is, love street art. We’re talking about legally applied works of art. We’ve heard nothing but positive comments, and even the one or two who aren’t fussed have certainly voiced their appreciation of having something more than a blank wall to look at. We thought it would be interesting to include people from the start, instead of just hearing what they think afterwards, to get public opinion or better yet involve them. We wanted to do something different that hadn’t been done before and use digital media to determine the fate of street art. 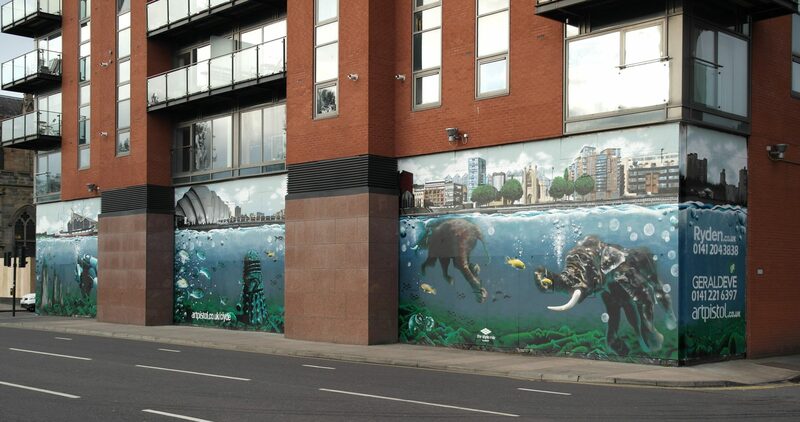 Street art exists in the street and in the digital world, as when a new work pops up it almost certainly ends up online, so the two worlds have a very good relationship. 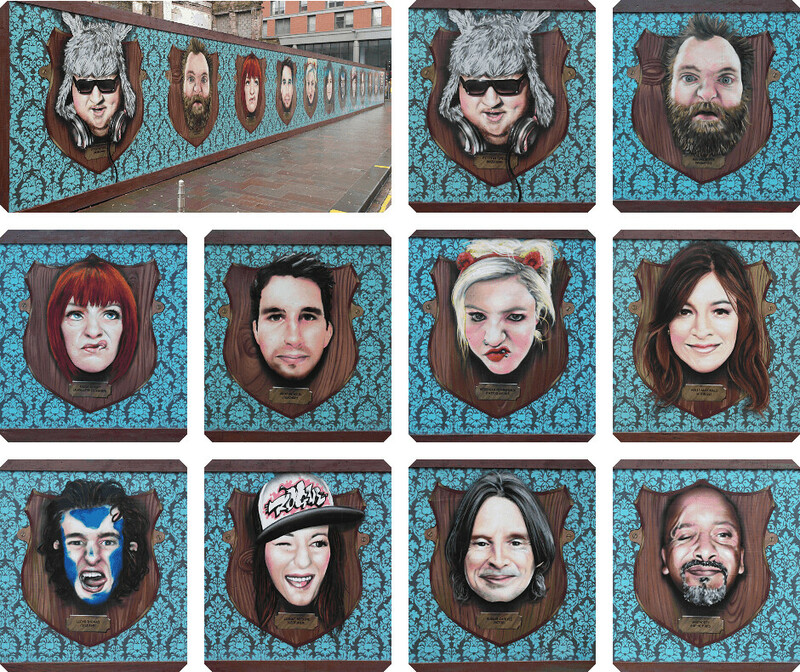 We decided to paint a wall celebrating the many faces of Glasgow, including celebrities and the general public. We asked Glaswegians, by birth or by choice, to submit photos of their faces via our Facebook page. Our social media did its thing and we quickly had lots of willing participants. STV also picked up on the story, read their take here. 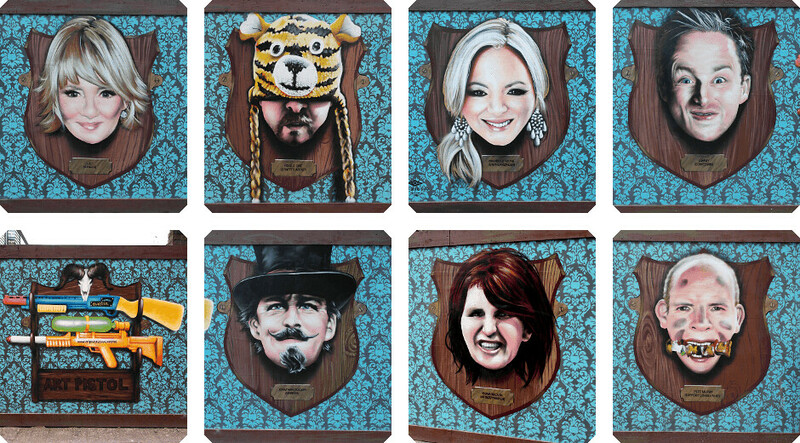 Many brave souls submitted photos knowing full well the fate that would await them if their face was pulled from the boss’ hat, which in fact looks a little like one of the hats on the mural… which one of the 4 you ask? Their faces were to be painted on a main Glasgow street, and they were going to be big, over 1 metre tall and mounted proudly as trophy heads on one of Glasgow’s many fine walls. While digital media and a hat took care of 12 adventurous heads, we approached 5 famous Glaswegians to add even more glamour. 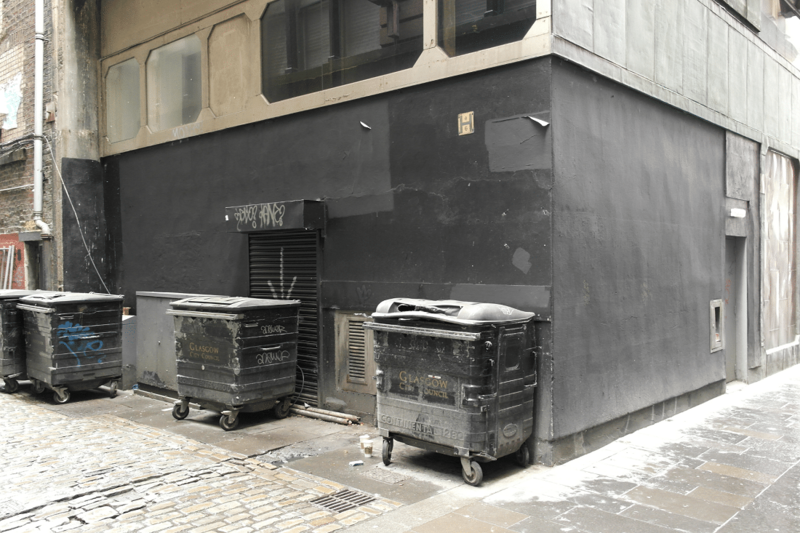 Robert Carlyle, Kelly McDonald, Lulu, Michelle Mone and Brian Limond were all keen and we now had our 17 faces of Glasgow. 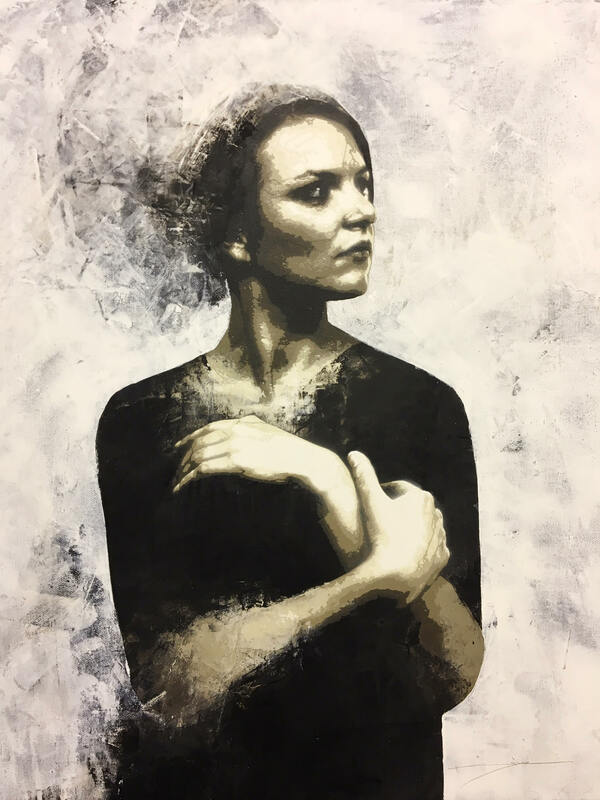 We have an artist, support consultant, barker, comedian, entrepreneur, graffiti artist, hip hop mc, singer, 2 actors, lecturer, student, tattoo artist, teacher, animator, jewellery designer and musician. It was then over to Rogue-One to bring these giant heads to life and that he did! Painting commenced and not even a fire or the relentless Glasgow rain and freezing air could hold him back. 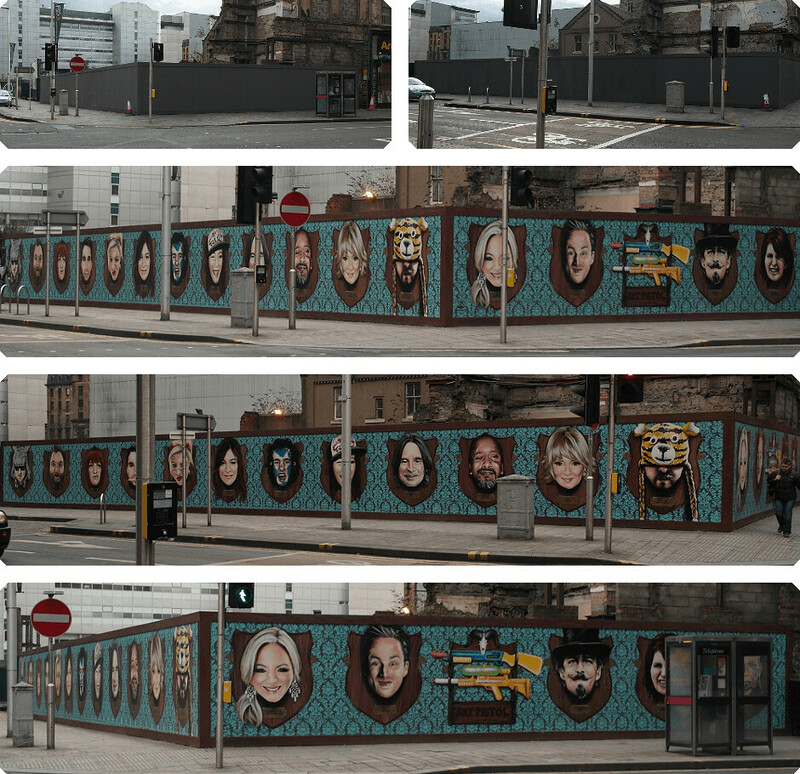 Here are the pics and if you get a chance go check it out, just a few blocks west from Central station on Argyle Street in Glasgow. Also worth looking at our Facebook page to check out some of our mural’ees who’ve posted photos of themselves in front of their giant selves! Or get in touch to discuss transforming a space now.